The unsung hero supporting industrialization of Vietnam. What is the secret of Bando Vietnam? Business name: BANDO MANUFACTURING (VIETNAM) CO.,LTD. 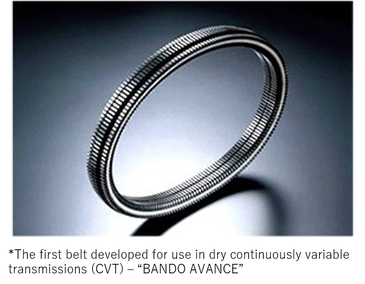 Nature of business: Manufacture/sale of transmission belts for auto and industrial use. 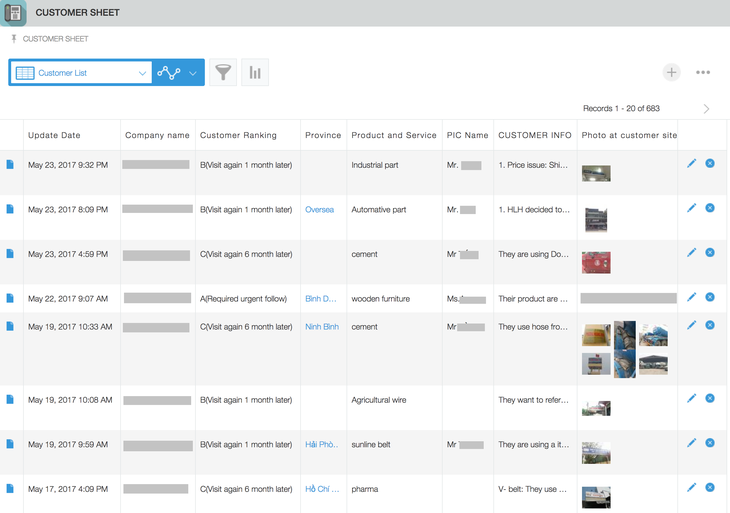 kintone usage: Sales information and estimates management, factory management, etc. Bando Chemical Industries, Ltd. (hereafter Bando Chemical) is a world-class manufacturer of belts used in motor vehicle engines, printers, and more, with market share to match. The company in charge of Bando Chemical’s manufacturing and sales in Vietnam is Bando Manufacturing (Vietnam) Co., Ltd. (hereafter Bando Vietnam). 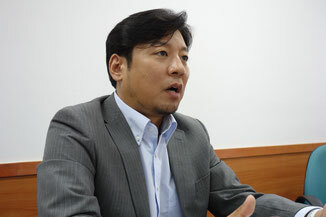 We paid a visit to talk to Mr. Ueda, General Director of the company. After its establishment over 100 years ago in 1906, Bando Chemical has continuously manufactured industrial belts. Times and materials may change – they originally used cotton, before moving to rubber, urethane and beyond – but today Bando Chemical’s belts are used in everything from car engines, office printers and resource development sites to ATMs and automatic doors. One of Bando Chemical’s defining characteristics is its worldwide scale. Bando has subsidiaries in over a dozen countries and delivers its products worldwide. And that’s all thanks to the company’s responsiveness. For example, a conveyer belt in a factory may require different belts depending on what it’s carrying. Another factory may be seeking a more delicate touch. As a pioneer in the belt manufacturing industry, Bando Chemical is responsive enough to meet the precise needs of its customers. That explains why Bando Chemical was the first to manufacture transmission and conveyer belts in Japan, and the first to develop a belt for dry continuously variable transmissions (CVT). Demonstrating their Products Doubled Orders?! Initially, excel files containing sales information were managed on a file server, but poor network conditions between Hanoi and Ho Chi Minh made using it difficult. Sales staffs had to handle information individually – hardly an ideal situation for grasping the big picture. 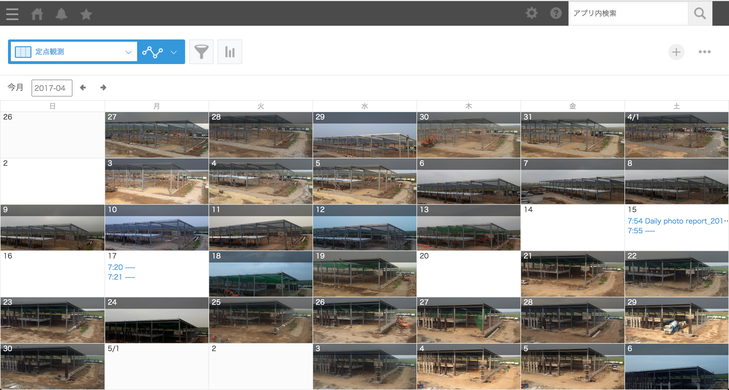 kintone’s services made it easier for managers to understand the big picture, particularly in regards to managing sales promotion information, estimates, and keeping track of the day-to-day progress on construction for Bando Vietnam’s new factories. Let’s take a look at each of these in turn. 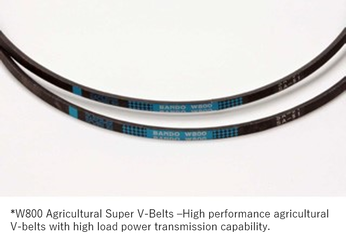 Bando Vietnam’s main business is the manufacture of transmission belts for scooters and other vehicles. Bike repair shops are the main location where customers purchase these and other parts for repairs. Determining how to generate interest in the parts with customers was key. Because Bando Vietnam’s belts occupy a high price range, it is important to make repair shop understand the unique qualities of their products so that it can be explained properly to the customers. Bando Vietnam’s sales staffs visited these shops regularly to listen to and record the voices of their customers. *Vietnam boasts over 45 million registered two-wheeled vehicles, which are owned by 85% the populace. 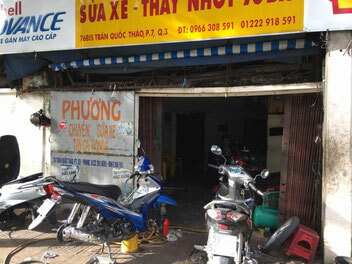 Bike repair shops like this one are indispensable for ensuring that the average Vietnamese citizen’s basic means of transportation keeps running. All of this information was once managed via Excel, but currently contains all of the data accumulated by sales staffs, allowing managers to grasp how many distributors are in a given area at a glance. 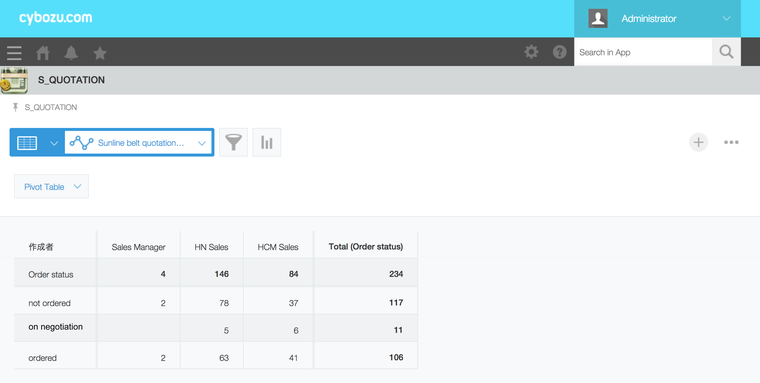 Now future strategies can be easily formulated with distributors. Bando Vietnam submits a large number of sales estimates on a daily basis. 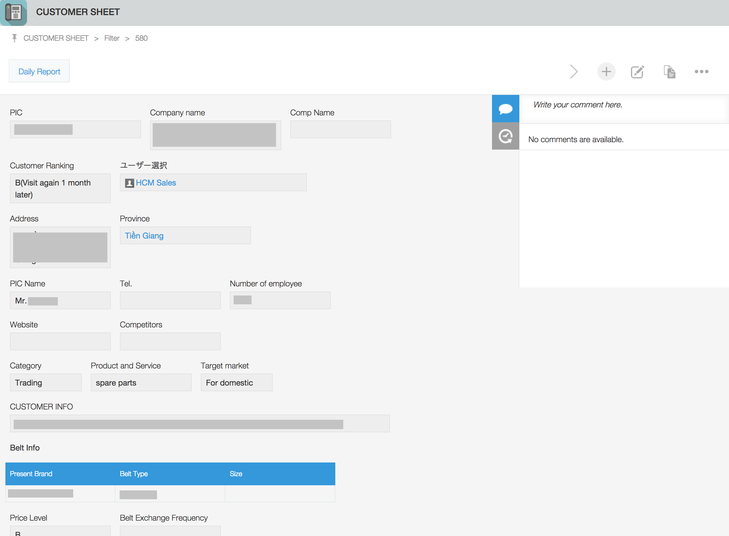 Previously, sales managers would create estimates via Excel and send them to distributors independently. Although managers could confirm the situation prior to submitting their estimates, they could not manage the activities after that. Currently, kintone records and prints estimates. Each estimate has a status field that can record whether the item has been “sent,” “ordered,” or “failed,” communicating essential information at a glance. *The status of sent estimates can be checked at a glance. Sales managers can then keep track of estimates marked as “on negotiation”. “Being able to understand the actual situation is incredibly important. For example, if we know that an estimate failed, the sales manager can confirm the reason for it. The reason could be a lack of sales effort, overpricing, or because they didn’t attempt to negotiate with the customers. Knowing the reason allows us to confirm the overall situation. Managers are now able to follow up with the sales staffs on the progress of specific issues. This is big improvement. We can feel our perception of the market and order rates alike improving.” (Mr. Ueda) As a result, the orders for a particular item have more than doubled following implementation. Bando Vietnam is currently building new factories, with Idemitsu Engineering Co., Ltd. in charge of the construction. 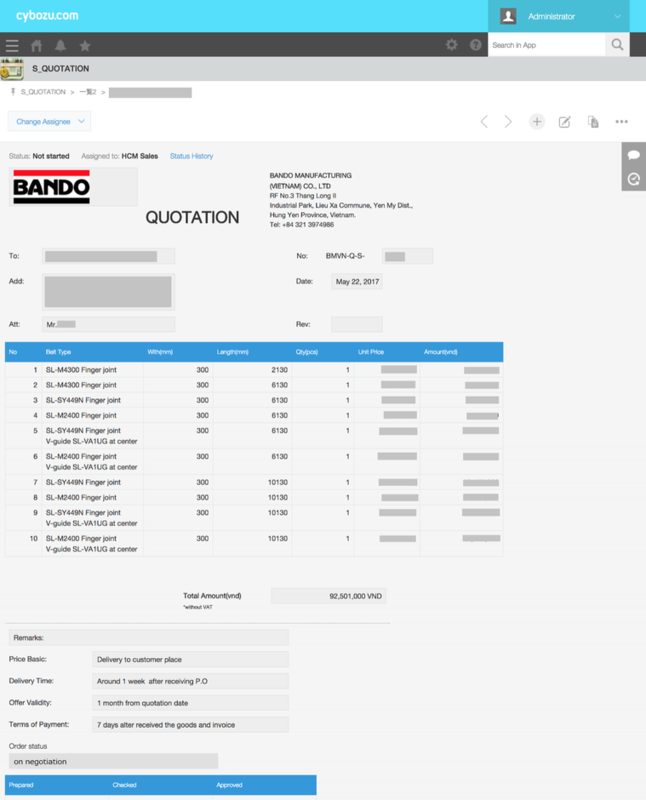 The three companies involved – Idemitsu Engineering, Bando Vietnam, and Bando Chemical’s HQ – all need to share information, with a vast number of emails exchanged on a day-to-day basis. By providing a shared workspace for all three companies before beginning construction, efficiency was dramatically improved. 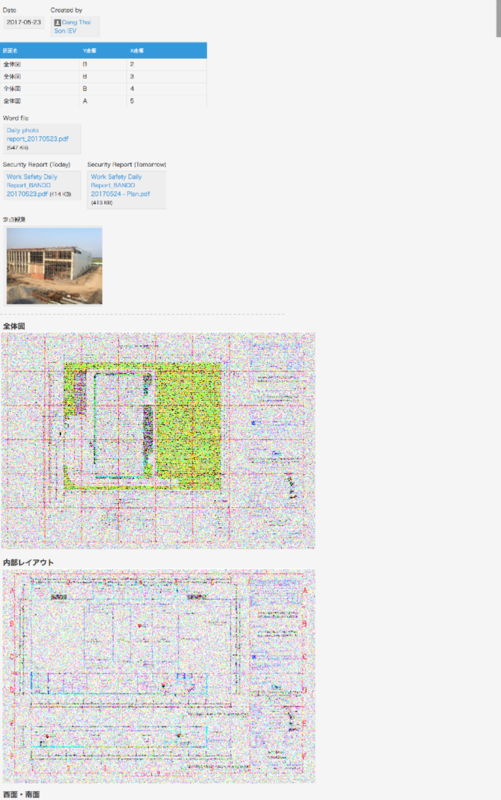 *Photos of factory construction progress. Previously, this was handled via weekly reports consisting of an excel file and photos, but a daily report from a fixed angle allows you to grasp construction progress at a glance. *Schematic management. Each schematic is divided into rows by letter and number, making it easy to pinpoint areas that need repair. In some unseen corner of rapidly-developing Vietnam, one of Bando’s belts is working silently and diligently. Today, tomorrow, and beyond.